Founded by two friends from Bologna, Italy, Cucina Amore is an unassuming local eatery with remarkable Italian cuisine and desserts. Cucina Amore Italian restaurant in San Marcos is open for lunch and dinner. The authentic Italian food menu features antipasti, pizza, pasta, specialty entrees, sandwiches, pastries and its ever popular gelato. Especially noteworthy are Cucina Amore's garlic knots, chicken pesto pizza, eggplant parmigiana and ravioli de ricotta and tiramisu. Liberal use of homemade mozzarella is just one of the many ways Cucina Amore shows quality ingredients and passion for great taste make for delicious dining. 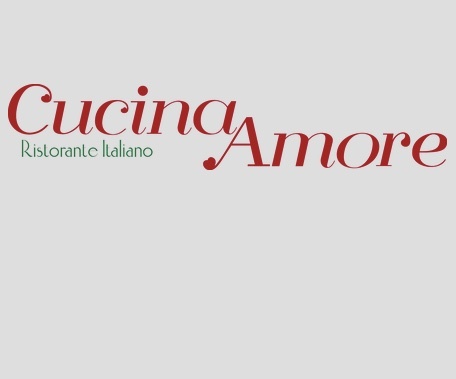 Enjoy Cucina Amore menu delights by dining in or order Cucina Amore online for take out. Cucina Amore restaurant is located on S. Rancho Santa Fe Road at San Marcos Blvd. in San Marcos, California. Angel hair pasta and sweet roma tomatoes tossed in evoo with fresh garlic and basil. Mozzarella cheese, tomato sauce, sausage, bacon, ham, pepperoni, bell-peppers, spinach, onions, olives & mushrooms. Light breaded chicken breast topped with marinara sauce and melted mozzarella. Served with a side of pasta. Italian mascarpone cream layered with lady fingers dipped in coffee and topped with dark cocoa powder. Spaghetti and home made meatballs in a marinara sauce. Linguine with grilled chicken, sun dried tomatoes, pesto, onions, and garlic. © 2019 Cucina Amore. All rights reserved.